Phytocultures has been a recognized leader in the transfer and adaptation of plant tissue culture systems for micro applications utilizing the advanced technology of in vitro plant tissue culture for more than 25 years. Our in vitro product is soil free, insect free, disease free, and combines the advantages of traditional plant production and growing techniques with new advanced techniques involving micro propagation. Phytocultures has a germplasm bank with many varieties of potatoes, blueberries, sweet potatoes, and other ornamental plants. As a cutting-edge horticultural company, Phytocultures has been specializing in Haskap genetics and propagation since their North American introduction. Under license to the University of Saskatchewan, our evolving research and procedures have developed and expanded new Haskap varieties, refined production, and improved harvest technology. 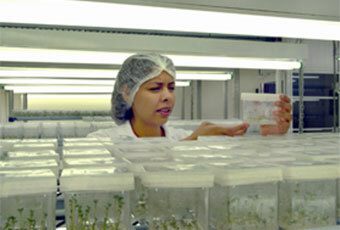 Our high-output plant tissue culture laboratory is able to accommodate large-scale wholesale orders of select Haskap varieties with production inventory exceeding 150,000 plants annually. Our R & D efforts extend to other crops as well, including the introduction of new and exciting varieties of potatoes and grapes adapted to our regional climate and suited to consumers’ evolving tastes.